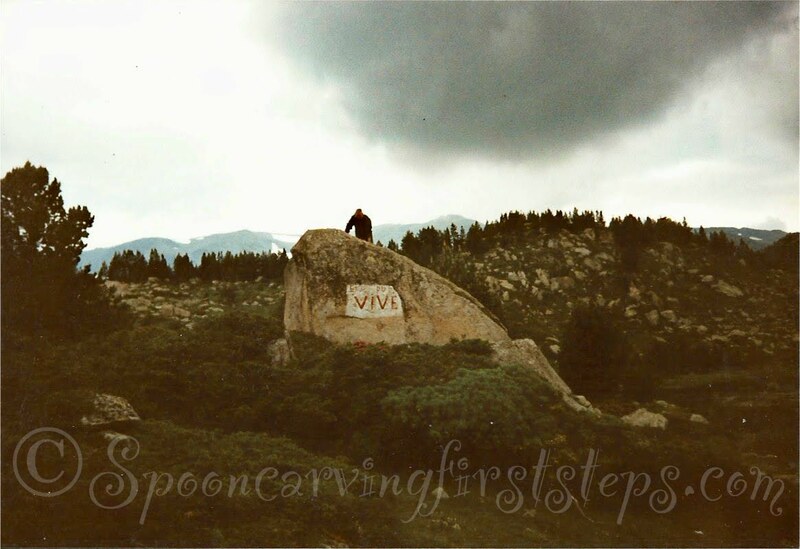 Spoon Carving First Steps: Camping Now and Then. I'm sat by the sash window, open so I can hear the birds and watch the woodpeckers feed from the bird feeder, wearing a jumper and covered by a warm blanket. 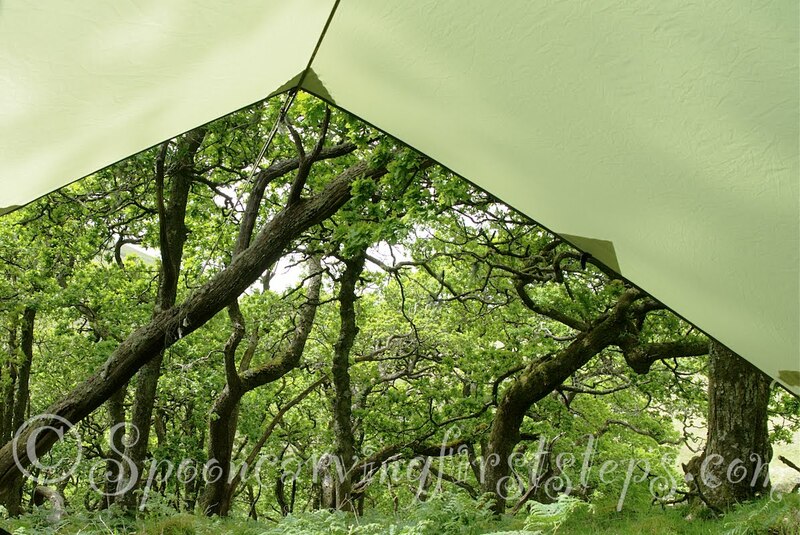 The washing isn't drying, due to the summer Dartmoor mist, different to the winter Dartmoor mist in the fact that it's ever so slightly warmer. We decided to forgo the hammock and camp under cover on a couple of blow up mattresses. Short, military types, long enough to keep the essentials insulated from the ground. 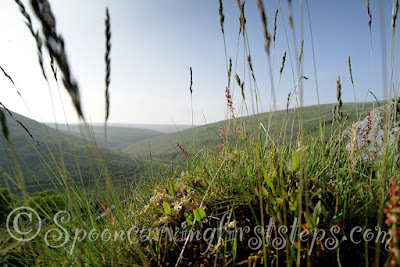 We headed out under a warm Devonian sun: skylarks singing, rising and falling as we made our way across some beautiful countryside toward our camp site. 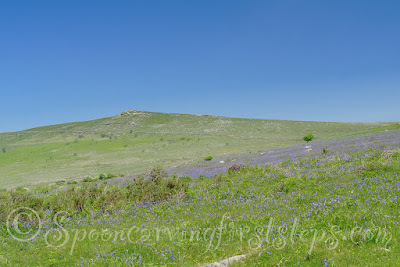 The Bluebells were out, their scent filling the warm air as we walked under Sharp Tor. We stopped a few times to take it all in and to give the camera some work. For those of you interested in the photographic arts I use a Lumix G3 with a pair of lenses. The lenses are Lumix 45-200 and Lumix 14-42. The camera is micro 4/3 format. After a short time, we could see the woodland in the distance. 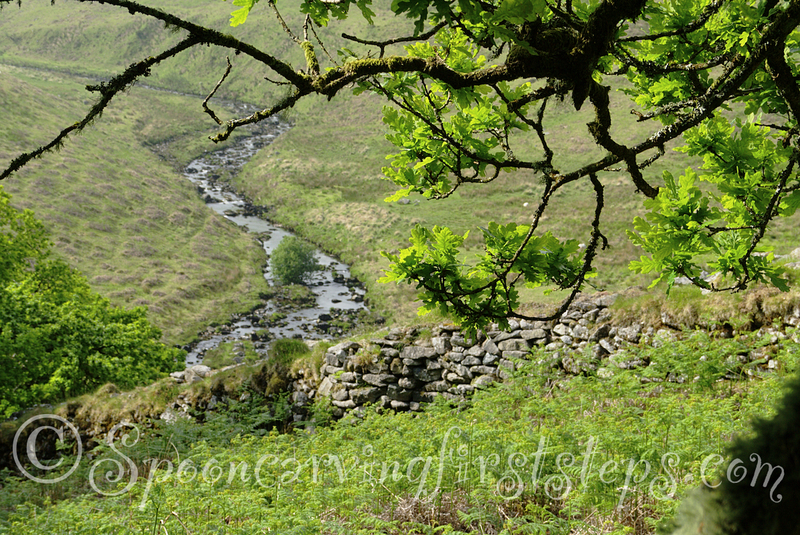 Once we entered the woodland, hard on the banks of the Erme, a stream of memories returned. 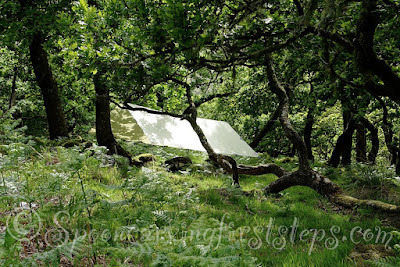 I have spent many a night here in the copse, it was always a place I enjoyed visiting on my walkabouts and somewhere I would try to include on a route; reasonably sheltered with plenty of fresh water, bathing opportunities in the right season and perhaps a smouldering damp Oakwood fire. Piles Copse has everything one needs for a fine camp, except perhaps dry firewood. I've noticed since the advent of 'Bushcraft' popularity that more fires are being lit, some folk even trying to burn green oak fresh from the tree. Conservation and a gentle approach to nature is the key whatever you wish to call your pastime. 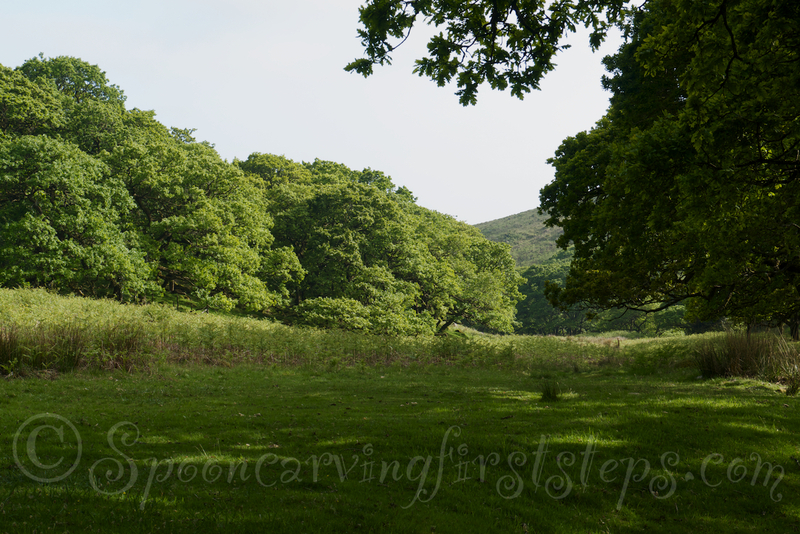 It was wonderful re-visiting the woodland. 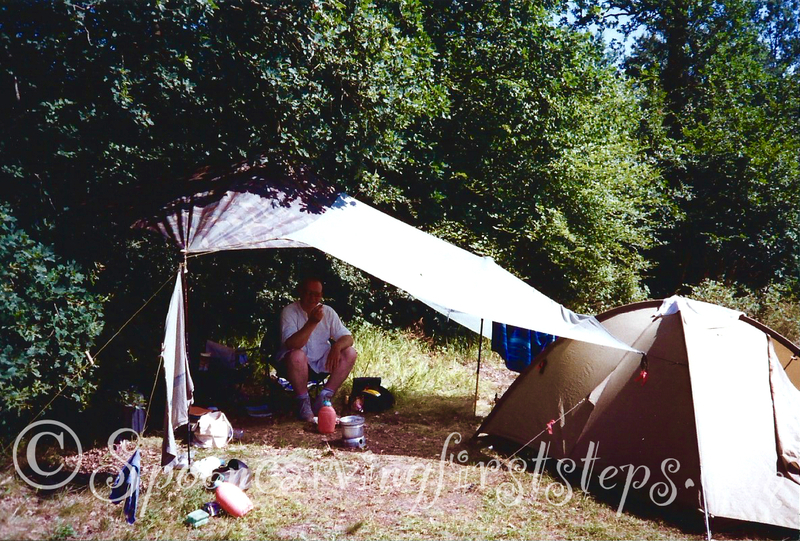 We chose somewhere to camp, high up on the hill overlooking the wood and river. Once camp was up I nipped down to the river for a fill up. 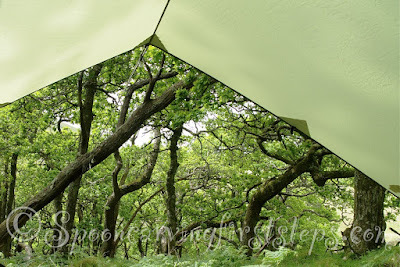 We took our Robens tarp and strung it up between a tree and an old hung up, windblown; dead oak. 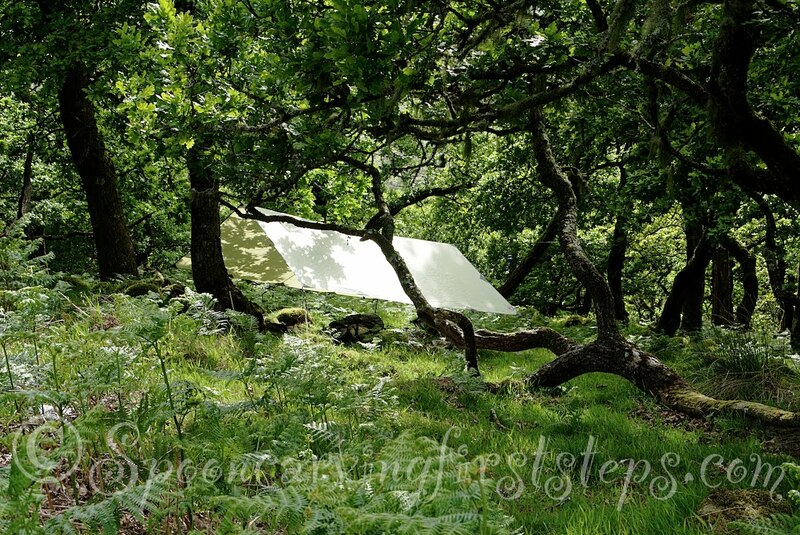 I tested the old tree before trusting it, it was strong as the fabled English oak and not likely to go anywhere. 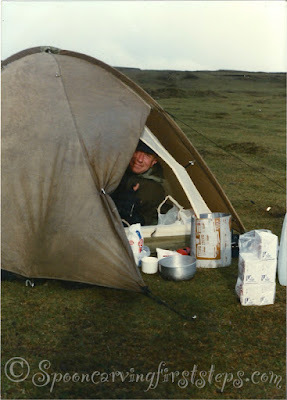 So, I've always approached camp as: shelter up, bedding out for an air, store non essentials in case the weather changes then kettle on for a brew. We both dived in once the bed was made, quite comfy if a little downhill, I'm sure we'll be fine. 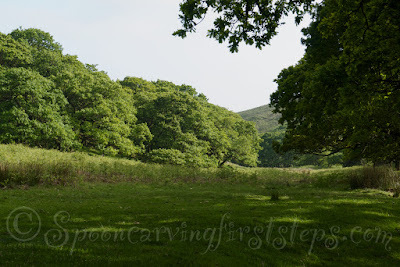 I mentioned earlier in my post that my return to Piles copse had stirred memories. 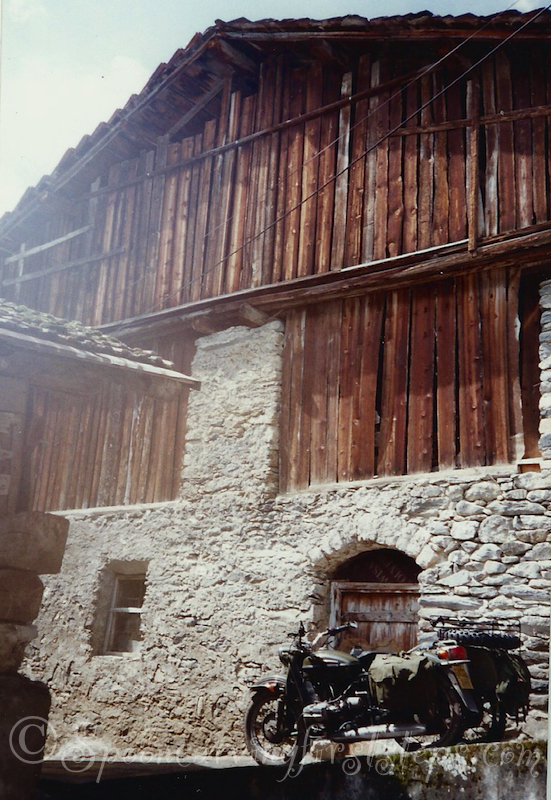 When we returned home, I had a rummage around in my small stock of photos. You know, the ones printed on bits of paper. I don't have many pictorial memories of the past beyond the year 2000, but I found a few that I'd like to add here. 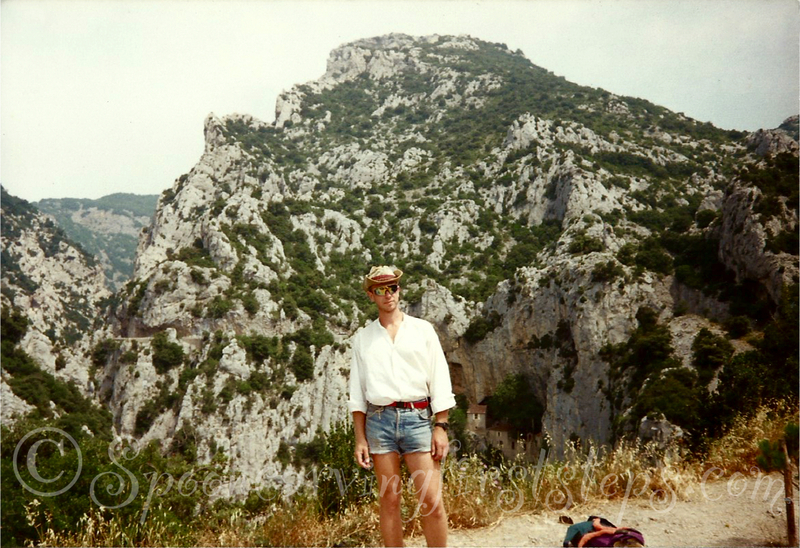 Don't forget though, I wasn't always the middle-aged grizzly bloke you see before you now. 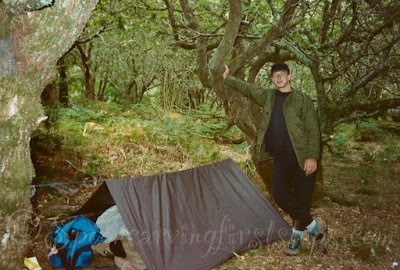 Back before the invention of money, before things as fun as a shelter sheets could be bought, I had to make do. 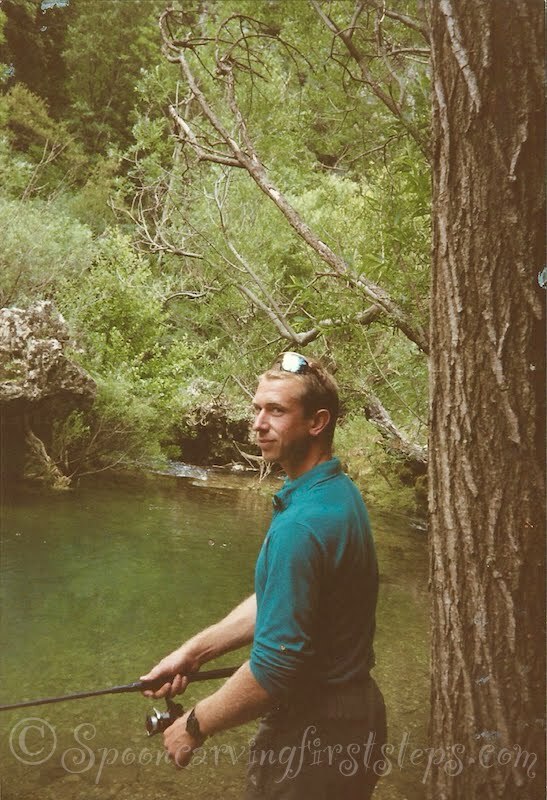 I used to spend as much time as possible up the river Dart with my friends from Totnes on the weekends, swimming and sipping the odd drink whilst cooking something that involved sausage or beans or both on a Camping Gaz Bleuet-206 like the one in the link, but rustier and not as posh. I know, I know.... He doesn't look old enough to own, yet alone use a stove. 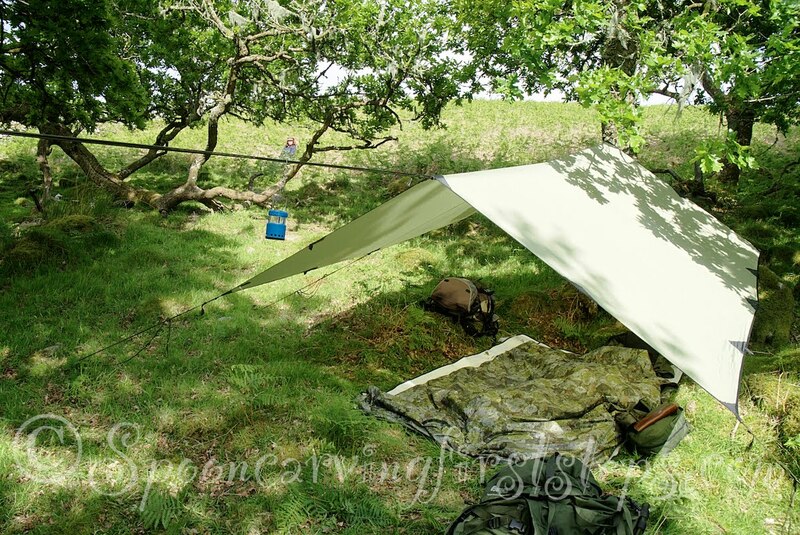 Here you can see the lesser spotted Mac sporting a line of military cast-off's and a ground sheet standing in for a tent? I'm sure I can see a duvet poking out amongst that lot. I had a tankers sleep suit from Germany at the time, and no kip mat, bloody freezing. Fine use of some blue polypropylene rope though - a step up from bailer twine, which if you hadn't realised is the only thing keeping Cornwall from drifting into the sea. Bailer twine has many uses down here, from gate closure and fence repair to trouser holder upper. Well, over time and with experience one learns the trick of the trade, I soon began to master the art of keeping warm at night. 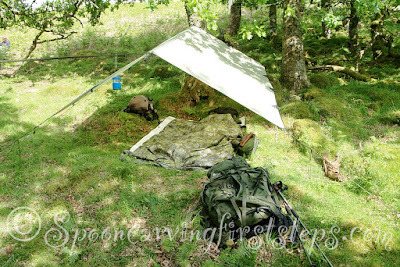 Sarah and I set our bed up using a reflective camping mat by Highlander and a couple of inflatable camp mats. The Highlander matt weighs next to nothing and comes in handy as an under blanket when hammocking - simply fold a poncho liner, add string to corners and slip the Highlander matt inside. You'll be pleasantly surprised how warm it is. I'll post a photo one day soon. We also decided to employ the Fjellduken Jerven bag and a couple of poncho liners. Sharing the bag made for a very warm night, it was a little damp with condensation in the morning, as the waterproof material is not breathable. However the bag was still very warm and the condensation could not be felt until I hung it up on the line for an air during the day. The Primaloft insulation is very forgiving and dries super fast. We set the kitchen a short stumble from our bedding. I packed a couple of short racing spoons, just right for our evening dinner of a bolognese with rice. 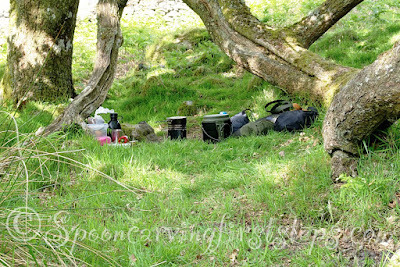 It's tricky finding light weight camping food that actually tastes nice. I doubt if some of the products available is actually food at all. The night before our camp I cooked up something we both like and popped it in a plastic box. Culinarily speaking, our meal was a far cry from some of the adventures I've been on. Here you can see my best mate Keith, the Doyen of cooking corned dog and onions over a miltifuel stove in sub zero temperatures. He has since improved to include some serious and tasty dishes to his wide and famous repertoire. As you can see, the attention to detail, even under the most trying conditions is faultless. The candle light adding a certain sense of romance to the bothy at Camban. I well remember walking in, carrying everything we needed for a stay at one of the most remote bothies in Scotland. Food, as much as possible but mainly consisting corned dog, (corned beef) onions, pasta, coffee, tea, chocolate, tobacco and brandy. Clothing, everything I owned, mainly made by Buffalo. Heating, half a bag of coal. My pack and back were groaning like a worm infested pirate's sloop; hard under sail; attempting to out run the Royal Navy due to some misunderstanding regarding the ownership of a few trinkets. Keith's was putting up a struggle too. 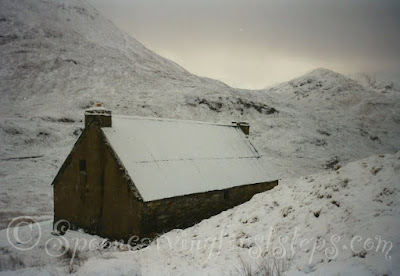 When we arrived at the idilic bothy it looked like this. We made ourselves as comfortable as possible, lighting a fire and eating a fine dinner followed by some great conversation over a brandy or a malt or two. The weather picked up in the middle of the night, we slept upstairs on the board floor and watched as the wind lifted the roof at the same time as a handful of snow was thrown in. Keith shrugged it off with a brew. It's amazing how quickly weather can change in mountainous regions, and not always for the better. I just had a quick peek at the M.B.A site. It looks like they put a new roof on Camban some time ago. Not before time if I was being utterly truthful. Well done to the volunteers at M.B.A ! 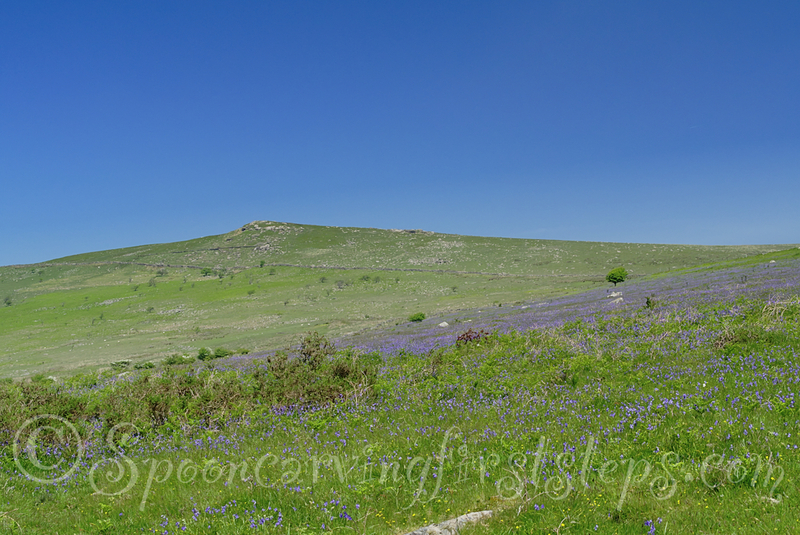 It was warmer on Dartmoor as we headed toward Piles copse I must admit. 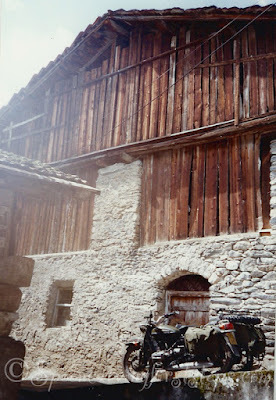 Sometime before getting cold in Camban I stayed warm by hitching round France and Spain. The snow was a lot warmer and the food more palatable especially when it's fresh caught. I remember camping at Le lac du Vive in the French Pyrénées Orientales, a stay lasting a week or so before moving off over the French border into Andorra and then Spain. This is the lake I camped by, Le Lac du Vive. I had a quick scout round Google and was surprised to find a set of photographs. This set of lakes which include Lac du Vive can be found at an altitude of 2237m and not very far from Pic Carlit 2921m, which I managed to climb one hot sunny day. 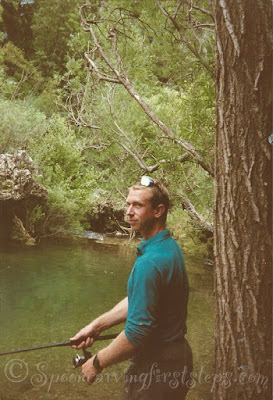 A spot of fishing happened here as well from time to time, memorable breakfasts next to a sweet smelling pinewood fire. It also rained, with thunder, at precisely 3 o'clock each and every afternoon. And I do mean thunder, with heavy rain. More practice for keeping warm and dry. And another reminder of changeable mountain weather. I know... It shocking... But panic not, I can categorically state those knees have been covered ever since. Not long after sleeping under the brown ground sheet seen earlier I bought a small two person Lichfield tent, which was a fine thing for a lightweight back packing adventure, but a little cramped if the weather came in and you were caught out in the open. Which I carried about all over the place in back pack and sidecar. The Vaude lasted for about and roughly 25 years. It succumbed to the ravages of UV damage last year. It accompanied me on my hitch hiking tour as well as many trips here and there up and down the country. 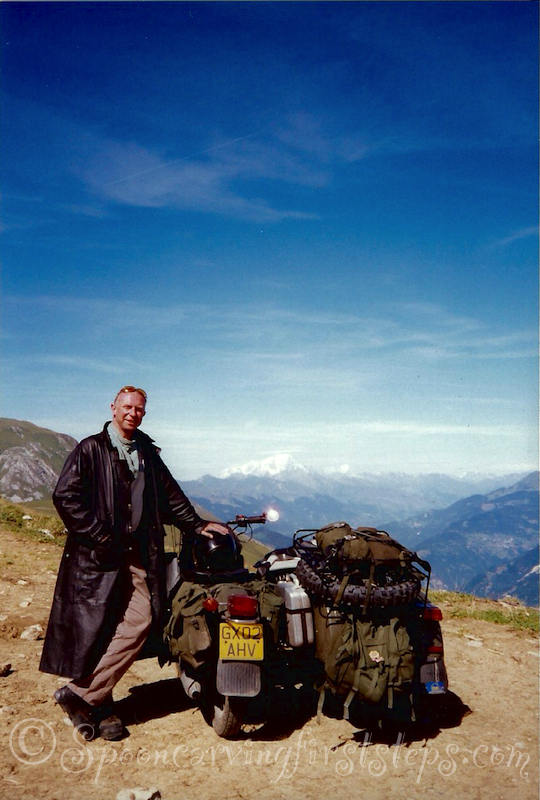 Later in its life it got strapped to a Russian sidecar for a few years, where it was driven across France, back and forth between the Massif Centralle and the French/ Swiss alps. 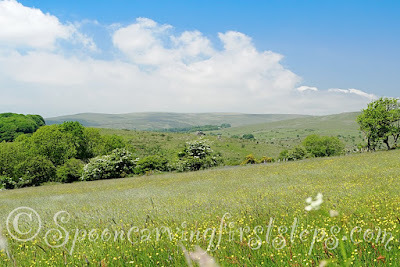 Back on Dartmoor Sarah and I spent our time setting camp and chatting about the birdsong we could hear and the wildlife we encountered. I guess we could have gone down to the river for a swim, but neither of us seemed in the mood. We sat in the sunshine for a while quietly chatting and watching the comings and goings both near and far. It's amazing how Sarah and I can spend time together quietly taking it in, we seem to have made it into an art form in itself. I popped a brew on as we decided we had just enough time for a hot chocolate before I made a start on dinner. So the stove was lit and we sat together keeping an eye on it whilst chatting. As a quick top tip, if you run out of fuel for your Swedish cook set you can utilise the wind shield as a wood stove, either way up will do. Just keep a weather eye on it. The day started to come to a close, so it was back to the stove to cook our dinner before the sun set. 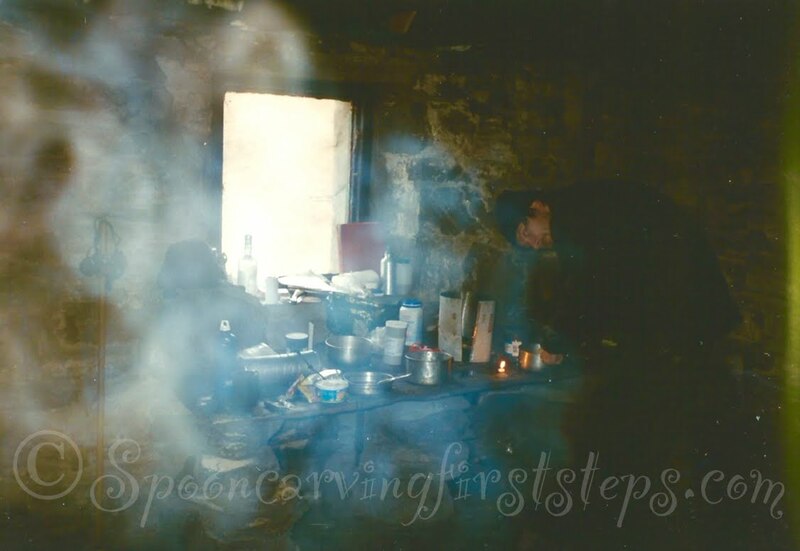 As I cooked we reminisced about our adventures in the 15 years we've been together, I guess that's why this blog is more of a reminisce than any practical guide. 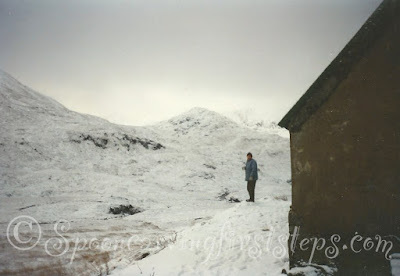 A meander through some of my memories and also a comparison between present and past. 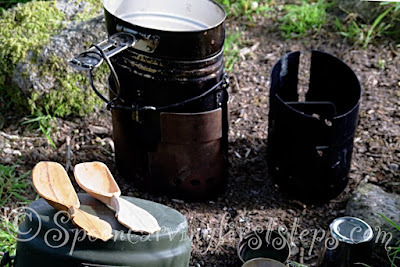 My equipment is generally better, and I know I can make shelter and fire without this gear, but there's nothing better than making a nice homely camp. We thought it would be fun if I shared a few bits and pieces from previous adventures. 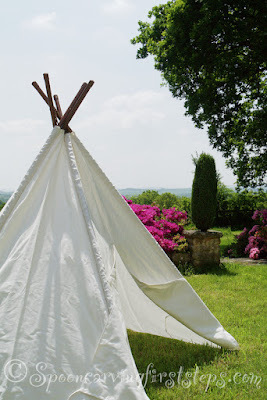 To show that when one starts out engaging with our wonderful wild world it's ok to make do and mend. It's also ok to make a few mistakes, as long as the place you chose to have them is relatively safe. I'm self taught with all the skills I use out in the wilds. In fact I'm self taught with most of the things I get up to. I think overall, over the years I've learned, like the Scouts, to be prepared. 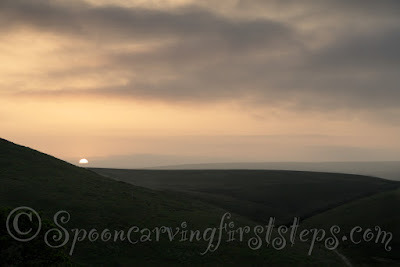 I remember teaching myself navigation on Dartmoor. It's a very tough place to learn, it becomes featureless at night and when the mist arrives. In fact its pretty featureless full stop. So I learned with a pack that had one of my old tents, sleeping bag, food and cooker. 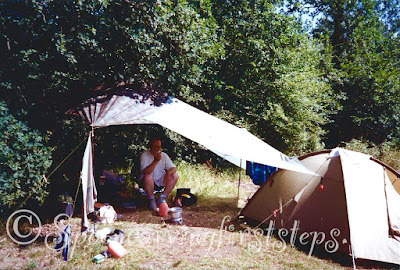 If I got lost, which I did from time to time I simply made camp and started over in the morning. I seem to remember often ending up at a place with a comic name. A nasty mire, wet underfoot. Not recommended at days end when you're supposed to be elsewhere, sleeping on nice dry land. 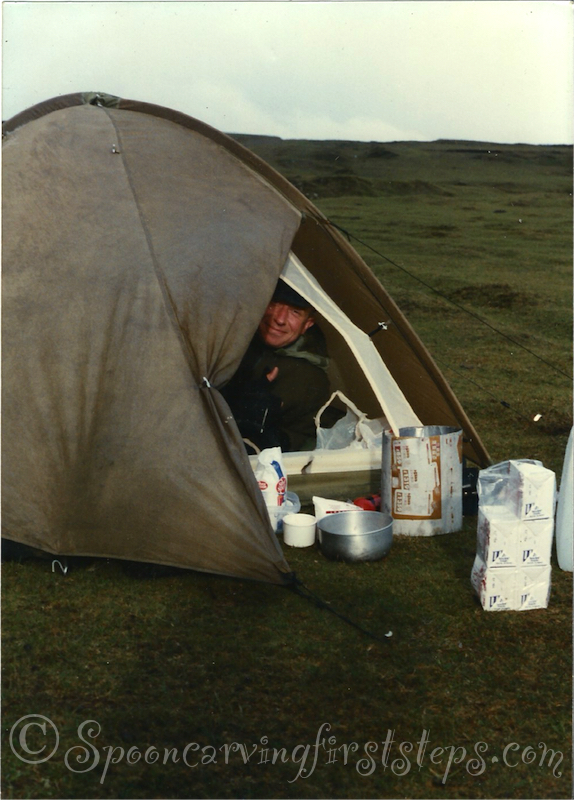 My regime seemed to work as a few years after the Dead Mans Bottom affair I passed the navigation test and was accepted for training with Mountain Rescue Dartmoor. So, the sun set and I lit the Uco candle lamp before settling in. Remember I mentioned our bed was on a slight slope? Sarah snuggled in and was asleep before the count of ten. I spent most of the night slipping down the hill 😊😳😆!!! Those are some great photos. 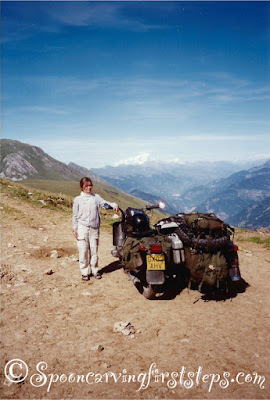 What year and model is that old BMW and was there any challenges to riding it with that sidecar and all the gear? 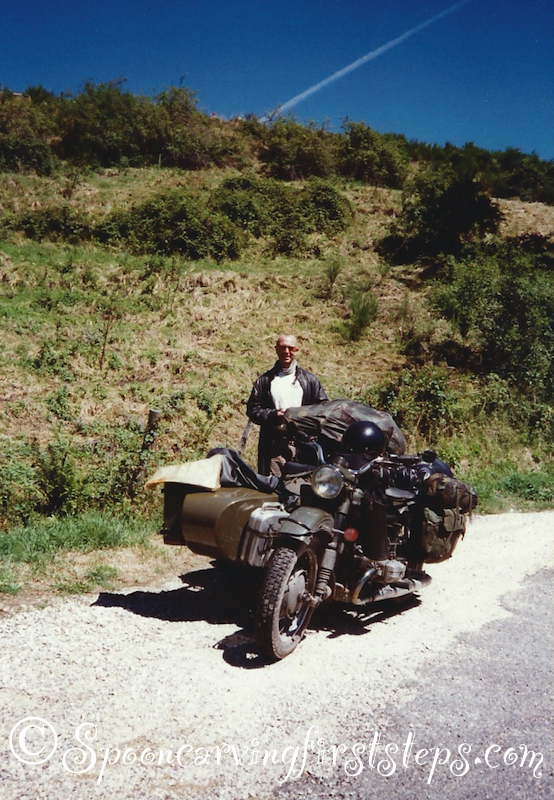 The motorcycle was a IMZ Ural 750 flat twin attached to a side car including a drive shaft so one could drive the sidecar wheel on rough terrain. 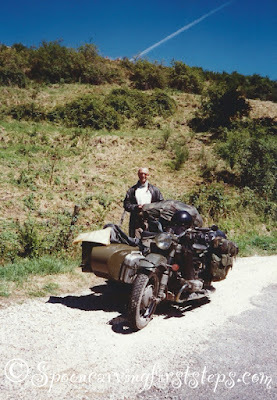 Riding a sidecar is neither fish nor fowl in it's handling characteristics. Riding a sidecar takes a bit of getting used to as you need to move your body weight across and into the chair on right turns and lean slightly out and away from the chair on left turns. If you don't move, the machine will topple over. Carrying weight is no problem. Glad you enjoyed the blog. Best wishes... JonMac. Oh my, what a beautiful area, it sort of brings a lump to the throat, being West Country born. Fantastic photos too. What wonderful memories. 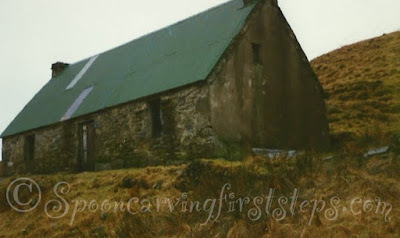 Camban bothy brings back memories for me too. 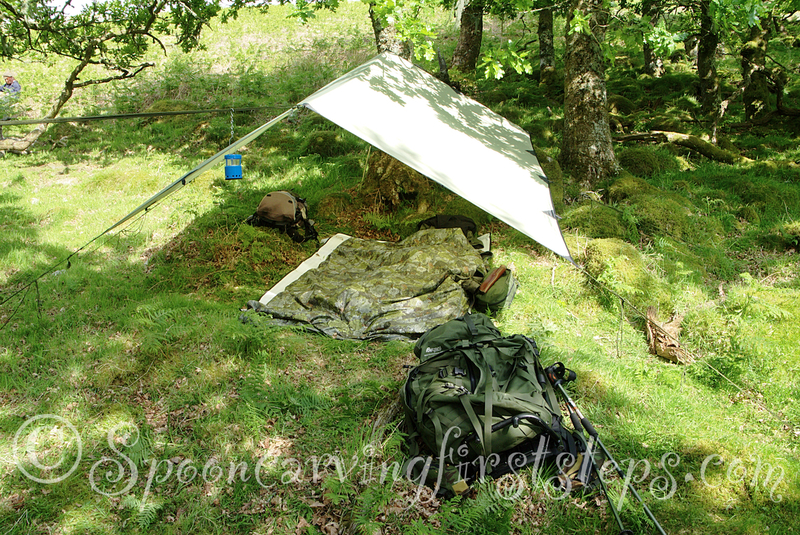 Storm bound there, the roof leaked and I had to use the flysheet hung from the rafters. Downstairs was wet and darned cold. Ah my, memories! Brilliant write up. I'm glad you enjoyed it, thank you for taking time to comment. Lovely set of pics Jon, great memories. Glad you enjoyed it. Hope to see you sometime down this way. Excellent write up Jon. Piles Copse and the area around it is my favourite part of the moor. 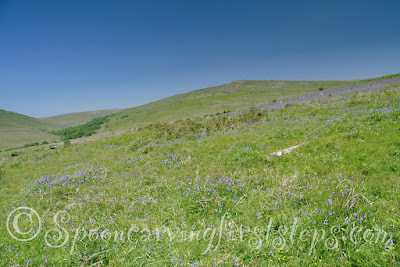 The view from Sharptor across to Stalldown Barrow is superb. I'm lucky that I live on the outskirts of Ivybridge which is near to Harford Moor, so get out there alot. Great photos as well. Ah yes. 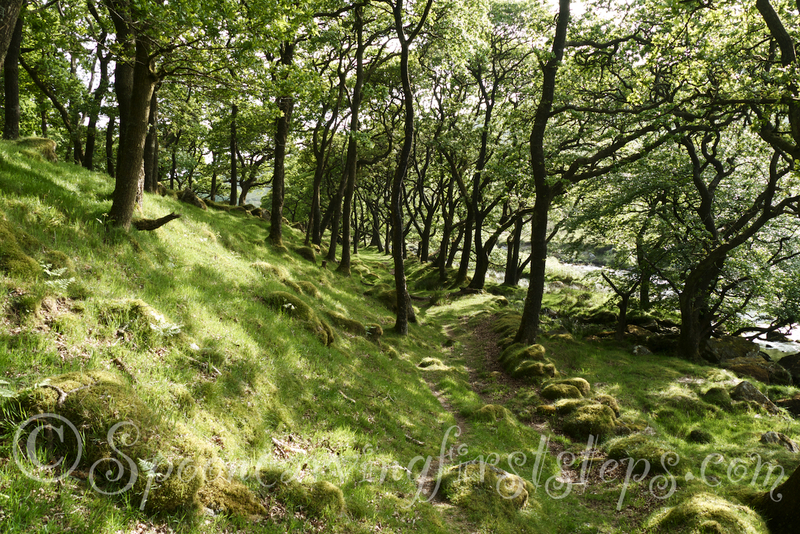 It's a beautiful part of the moor that's for sure. I've had some fun times there. I also remember some searches in weather you wouldn't put a dog out in further up toward Red lake and across to Avon dam. 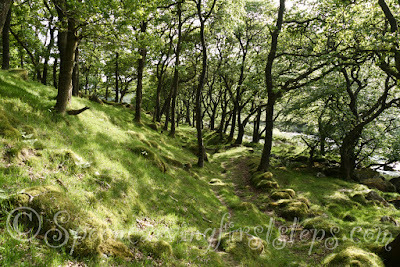 Glad you enjoyed the blog and the photographs.